Medium: pochoir stencil / offset print (after the painting). Issued in a limited edition of 995 and published in Paris in 1949 by Maeght for "L'Art Abstrait", a rare volume investigating the origins and theory of abstract art. Printed on thin wove paper, the total sheet measures 9 x 7 3/4 inches (230 x 198 mm). Shown here photographed against a white background (there are no margins). 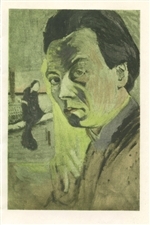 Signed by Robert Delaunay in the plate (not by hand). Medium: pochoir (after the oil painting). Printed in Paris by Daniel Jacomet, and published in 1961 by Berggruen. 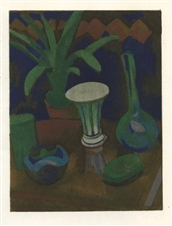 The image measures 7 1/2 x 4 1/2 inches (190 x 115 mm). Not signed. 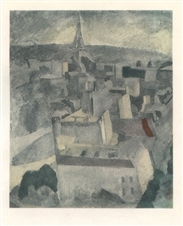 This is an example of the early work of Robert Delaunay, executed in 1909, before his abstract phase. Medium: pochoir (after the oil painting). Printed in Paris by Daniel Jacomet, and published in 1961 by Berggruen. The image measures 4 3/4 x 4 inches (123 x 100 mm). Not signed. This is an example of the early work of Robert Delaunay, before his abstract phase. Medium: pochoir (after the oil painting). Printed in Paris by Daniel Jacomet, and published in 1961 by Berggruen. The image measures 7 1/2 x 3 3/4 inches (190 x 93 mm). Not signed. This is an example of the early work of Robert Delaunay, before his abstract phase. Medium: pochoir (after the oil painting). Printed in Paris by Daniel Jacomet, and published in 1961 by Berggruen. 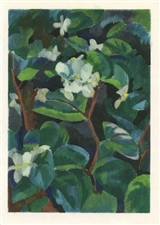 The image measures 5 x 3 3/4 inches (130 x 96 mm); with another composition printed on back, as issued. Not signed. This is an example of the early work of Robert Delaunay, before his abstract phase. Medium: pochoir (after the oil painting). Printed in Paris by Daniel Jacomet, and published in 1961 by Berggruen. The image measures 5 1/2 x 4 inches (140 x 98 mm). Not signed. This is an example of the early work of Robert Delaunay, before his abstract phase. Medium: pochoir (after the oil painting). Printed in Paris by Daniel Jacomet, and published in 1961 by Berggruen. 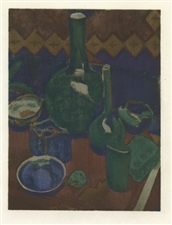 The image measures 5 x 4 inches (130 x 100 mm). Not signed. This is an example of the early work of Robert Delaunay, before his abstract phase. Medium: pochoir (after the oil painting). Printed in Paris by Daniel Jacomet, and published in 1961 by Berggruen. The image measures 4 3/4 x 4 inches (120 x 100 mm). Not signed. 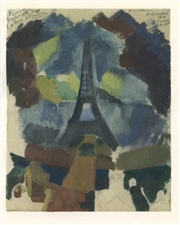 This is an example of the early work of Robert Delaunay, before his abstract phase.